Around two days ago, Israeli ISPs began to block access to certain websites from Israel. The list of the websites is considered confidential, and included, by media reports two websites related to gambling. The issue in matter began around two months ago, when the Israeli police, alongside the tax authorities arrested 28 suspects who were suspected in collaborating with two websites: Stan James and Victor Chandler. Following a brief period of time, the police approached the Israeli ISPs in request to block access to those sites claiming it has the authority to do so by clause 229 to the Israeli Penal Code. Though they had not had a court order, the commander of the police district interpreted his authority enacted in the act, which is defined as “The Chief of a police district may order the closing down of a place where prohibited gaming, raffles or gambling is taking place” as such which governs also the realm of IP addresses and Internet Service Providers. However, up to this moment no ISP has challenged this authority in court. First, to the question of whether the police actually has jurisdiction according to clause 229 (and see Adv Ori Goldman‘s opinion on the matter); In two cases the courts heard cases which are similar, though none had to face clause 229. The first was the Carlton Case (CR 90861/07 Michael Gary Carlton v. Israeli Police, Dr. Omer Tene‘s explanation on Carlton) where the Israeli police requested to detain a foreign national who was involved in the operation of the Victor Chandler website (blocked now). Carlton stated that as the website does not operate from Israel, the Israeli law does not apply to acts performed outside of Israel by non-Israelites. The court denied the claim, and asserted that Carlton’s acts were illegal as “In light of the fact, that the appellant has the ability to identify the place of the end-user, prior to registering to the website, the appellant and his company’s blind-sight is material. It is expressed by the fact that while they are aware that gambling is prohibited in Israel, and by greed, knowing that the Israeli public is profitable to the company, they do not act in order to block access to Israel“. The other case is related to blocking a file sharing website by request of the record companies (OCR 3485/08 NMC v. Eli Amar. However, the Amar decision was not a reasoned one, but a brief consensual decision. As a general rule, the Israeli courts ruled that actions which are available to Israelites are under their jurisdiction and the Israeli criminal law may be applied on any activities. However, where the authority under clause 229 applies remain unanswered by Israeli courts, as the supreme court has yet to rule on the interpretation of the matter, without relation to the Internet, and lower courts ruled regarding the clause without actual discussion on the cases, and approved warrants as a matter of habit without discussing constitutional right. In one rare case, the court observed the infringement of constitutional rights (AA (Jer)1666/09 Salima Kazam v. Israeli Police) and explained that the court is too extensive: The police chief has a rare authority to issue, based on administrative ex-parte evidence, a closing warrant which is permanent and constitutional human rights, both a person’s right for freedom of employment according to Basic Law of Freedom of Employment and his right for property according to clause 2 to the Basic Law of Human Dignity and Freedom. This is performed in the same place where the court, even after convicting a person in possession or managing a place of unlawful gaming according to clause 228 to the penal act, may only fine or incarcerate the person“. The court emphasized the personal manner of the warrant, and human rights, even after rejecting the request to quash it. However, in another case, the court ruled that “the warrant is to close a place, it goes with the place and is applied on the place without regards to who operates his business in such place. changes in the identity of the person who operates the place do not affect it … a warrant could be issued even without personal names, where you do not know who operates the place. The warrant has in rem applicability” (AA (Haifa) 538/02 Romach Trade Co. v. Zevulun Police). However, in one case the district court interpreted the rationale behind 229, where it ruled, interpreting the Supereme Court’s ruling in RCA9140/99 Romano v. State that “The rationale behind the law’s foundations … is not detached from the law’s purpose, which is to rule out social plagues who endanger a person and society” (OCR (Tel-Aviv) 32354/03 Gilian Trade and Marketing v. Israeli Police). The purpose in issuing a 229 warrant was made to assist in preventing the negative impacts of gambling on society, such as criminal activities; the rule is, that the police may act only to enforce the law and not deter or punish (ACD 2316/95 Ganimat v. State, C (Krayot) 15336-01-10 State v. Amiaz); you cannot punish the proprietors of the place, its users and others from legitimate uses in the same way you cannot arrest a person as a penalty. Therefore, the requested conclusion is that when both gambling and non-gambling occur in a segregated manner, the legal activity cannot be closed down (AA 236/04 The 7th Heaven v. Israeli Police, where other courts ruled, strangely, that 229 is punitive or deterring, AA 1709/09 Amar Razam v. Jerusalem Chief of Police) and the gambling itself the police has to stop, where the collaborators have to be arrested. This conclusion arises from the same constitutional rights, including freedom of employment and right for property and dignity. The police’s authority could not be used to deter and cannot be directed towards activity which is not gambling. The police has to perform its acts in a responsible manner for the public. From here, we address the issue. First, the police did not act in accordance to its authority under 229: the warrant was not personal and was not addressed to the proprietor of the place, but solely to who provided access to it; a warrant to block websites served to an ISP is like providing the bus company a warrant to remove a bus station next to a gambling house. The ISP is not the proprietor, not the operator and is not the required party. As far as the police has claims against a website, it should address its operators even if they are outside of Israel and initiate criminal proceedings. If the police still believes that the Carlton decision is in force, then they are are free to act with accordance to it. Second, the warrant’s breath. 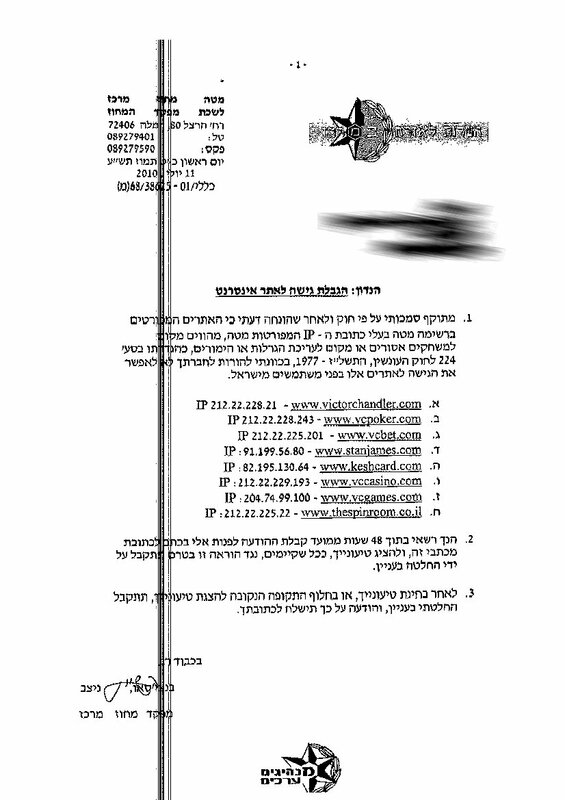 The warrant, granted against the websites and IP addresses [See Hebrew Warrant] requested to block the website in full, even the parts not related to gambling. For example, if a person plays without waging a bet, solely in thePlay for Fun part of the website, then he is affected by the warrant without need. In such case, the warrant is not narrowly tailored in the means needed and affects constitutional rights. Moreover, providing a warrant against an IP address and a domain is considered equal to closing a shopping mall because one kiosk sells raffle tickets. In contrast to the Amar Razam decision, these are two distinct different groups of users, different communities and uses, and no need to block the play for fun. This means that we already began the slippery slope (which our ministry of communication rejected): some of the websites blocked are not gambling sites, but only facilitate funds; one case. of KeshCard.com, at least until proven otherwise, is a website for financial services and not gambling. The websites allows payment, amongst other things, for gambling, but is a financial service similar to others and is not different from credit cards; therefore, there is no reason to block it. Finally, it is quite difficult not to discuss the websites blocked. Though the police know about hundreds of sites, the two families blocked relate to a regulated market in Israel: sports booking. The Israeli Council for Sports Betting regulates and operates the market heavily, and the proximity to the World-Cup, where the Council’s earning skyrocketed, is strange. Moreover, the proximity to the Israeli Anti-Trust Authority’s decision to consider pressing charges against The Pais, Israel’s second licensed gambling operation, after suspicion arose that it entered into a restraining agreement where the Israeli Association for the Soldier which is licensed to act as well, where ISA shall not engage in raffles, against a material donation from The Pais. Moreover, The Pais offered more money to be provided to the country for more gambling rights, and even to pay salaries in local municipalities, and has previously offered to assist the police financially in the struggle against unlawful gambling. In conclusion, it is quite obvious the censorship could not stand; in order to drop it, a person using KeshCard or plays VC with “Play for fun” (meaning a person who was hurt by the warrant) shall appeal against the censorship to a court. The ISPs forgot what is the public interest they are meant to protect, and the ministry of communication, who’s authority was run over in one police warrant, does nothing.